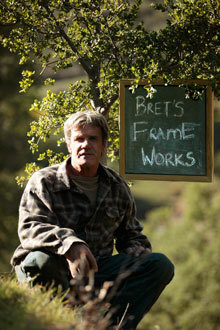 A California native, craftsman Bret Barish has been working with wood for 35 years. Barish moved to the Sierra Nevada Mountains at age 10 and began collecting dry wood in the forests and driftwood in creeks, carving small pieces for friends. In the early 1980's, Barish moved to New Mexico where he collected cedar, piñon and red and white oak to create mirrors and picture frames, selling his craft first at Tesuque flea market north of Santa Fe, then to various Santa Fe galleries as his reputation flourished. In 2010 Mr. Barish returned to his family’s Point Dume homestead setting up his woodshop on the gentle slope of a ravine leading to Little Dume beach. Barish now explores Malibu’s beaches and canyons in search of suitable fine woods with unique texture and color (primarily eucalyptus) from which to craft his distinctive mirrors and picture frames, ranging in size from six inches square to five by eight feet. “When I pick up a piece of wood its character speaks to me.” The wood he selects and hauls back to the shop is not small: Each frame is crafted from a single limb after Barish methodically dries it on site. Using one continuous piece of wood Barish fashions nearly-seamless mitered joints with the grain uninterrupted around the work. Each frame maintains the character of the wood from which it was crafted with imperfections lovingly sanded to a velvety finish. Barish’s intensity, painstaking craftsmanship and reverence of his medium are reflected in the joinery and finish details. The mirrored glass is custom cut to the contours of each frame and even the backsides draw admiration from his customers. His clients include world renowned artists, actors, and several Interior decorators. Bret can custom create any size mirror or picture frame. Please call him at 310-579-5060 or email BRETSFRAMEWORKS@GMAIL.COM to discuss details, shipping information and availability. He can also frame any of your artwork if needed.